This badge was issued to Juan David Arroyave on 20 Apr 2018. 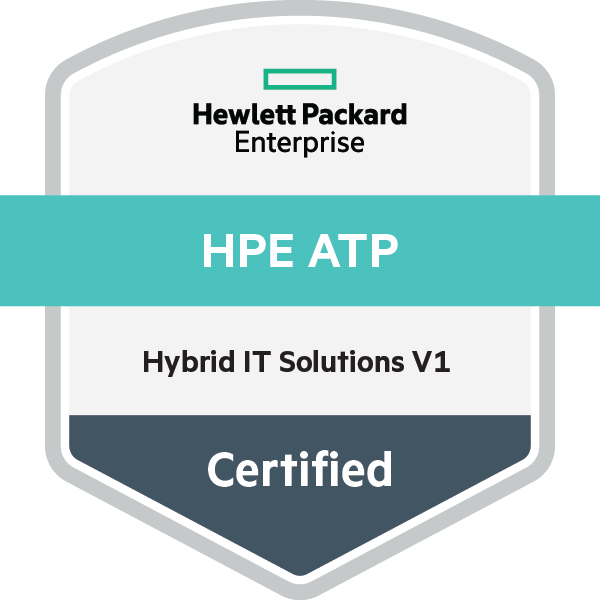 This badge validates the achievement of the HPE ATP - Hybrid IT Solutions V1 certification. The certification verifies an earner can identify, describe, configure and manage foundational HPE data center solutions centered around storage, networking, and servers including HPE ProLiant Gen10, 3Par, Nimble and OneView infrastructure management. They are able to evaluate requirements and recommend the best solution for current and anticipated business needs. Complete Building HPE Hybrid IT Solutions, Rev. 18.41 and Introduction to HPE SMB Hybrid IT Architectures, Rev. 18.41. Training is highly recommended but not required. The exam is NOT required, if the individual holds all of the following certifications: HPE ATP- Server Solutions V3 or V4 and HPE ATP - Storage Solutions V2 or V3 and HPE ATP- FlexNetwork Solution V3.